Norfolk's new Half Moone cruise terminal has opened and awaits cruisers sailing from the Port of Norfolk this year, as well as those on cruise ships calling at Norfolk. Royal Caribbean International guests embarking in April became the first passengers to sail from the new terminal. Carnival Cruise Lines guests will also utilize this new 84,000-square-foot facility as will passengers on other lines with port calls at Norfolk. What can you expect at the new terminal? What's downtown to see and do? The new facility certainly has "location, location, location." 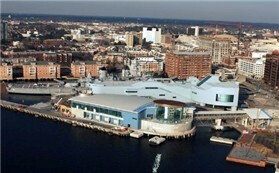 It's right in the heart of downtown Norfolk, adjacent to Nauticus, the National Maritime Center. In 1607, 104 brave English settlers sailed across the Atlantic. Settling at Jamestowne, VA (originally spelled with an "e" as in the Queen's English), they founded America's first permanent English settlement in the New World.